What is a Legal Separation and How Does it Differ From Divorce in Orange County CA? What is a Legal Separation and How Does it Differ From Divorce, is a frequently asked question our firm receives. You may have heard of a legal separation, especially if you have discussed or looked into getting a divorce in California. Sometimes, it can be hard to understand what a legal separation is, or how it differs from a divorce. We’re here to help! 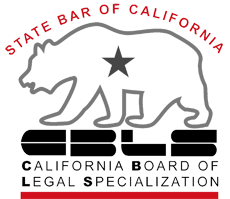 This basic guide to legal separations in California can help you understand the fundamentals of legal separations. Remember, nothing you find on the Internet can help you as much as talking to a qualified family law attorney in your area. Even this guide is not a substitute for professional legal advice. Attorney for a legal separation in Orange County CA from Bettina Yanez Divorce Attorney on Vimeo. What is a Legal Separation and How Does it Differ From Divorce in California? What is Legal Separation and How Does it Differ From a Divorce in California? A legal separation is one of the three main ways to end a marriage or a registered domestic partnership in California. The other two are through a divorce or an annulment. Deciding which of these is best for your situation, or which of these you can legally do in California is best done with the help of a little independent research and a discussion with an attorney. In many ways, a divorce and a legal separation are similar. The main difference between them is that a divorce will end a marriage or registered domestic partnership and allow a couple to file taxes separately or remarry, a legal separation will not. Legal separations will, however, allow the couple to continue sharing health insurance, and go their separate ways without technically getting a divorce. Both divorces and legal separations allow the court to make orders that will dictate how part of the couple’s lives will change. One of the things that the court can make an order for in both a divorce and a legal separation is child custody and visitation. In both situations, it is unlikely that the parents will live together, so the court will issue a court order that states where the child will spend his or her time, and who will be able to make decisions for the child’s life. Another court order that can be issued in a legal separation as well as a divorce is one regarding support payments. All parents in California are required to support their children financially. Child support orders are issued in all kinds of situations to ensure that parents are meeting this legal obligation, including situations where parents are not living together or are not married or in a registered domestic partnership. After a marriage or registered domestic partnership ends, both parties can expect to have a quality of life similar to that which was established during the marriage or registered domestic partnership. Because a legal separation ends the marriage or registered domestic partnership, a spousal support or partner support order may be issued. A family support order combines child and spousal or partner support into one court order, and may be granted when families divide during a legal separation. Following a legal separation, both parties will go their separate ways. Because of this, all property, debts, and assets will needed to be divided between them according to California’s community property laws. In a legal separation, the courts will issue a court order regarding the division of property, debts, and assets. 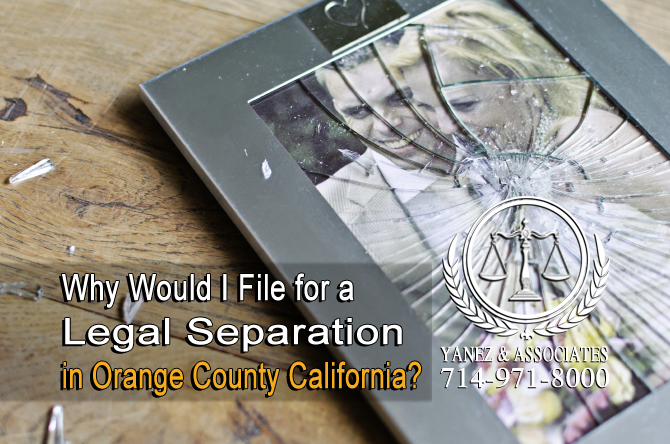 Why Would I File for a Legal Separation in Orange County California? What are some good reasons Why someone Would consider Filing for a Legal Separation in Orange County California? There are many reasons why a couple would choose to file for a legal separation, especially if they are considering a divorce. • Some couples are not eligible for a divorce, but they do wish to obtain court orders regarding child, partner, or spousal support, the division of property, assets and debts, child custody, and visitation. Eligibility depends on several factors, and a couple may file for a legal separation now to obtain the necessary court orders, and then file for a divorce at a later date when they are eligible to do so. • A couple may not wish to obtain a divorce for religious or personal reasons. A legal separation allows them to receive all of the court orders associated with a divorce without actually divorcing. • A couple may have financial reasons for not wanting a divorce. Certain military benefits, social security, and things like health insurance may require couples to remain legally married for a set amount of time in order to earn or retain benefits. • A legal separation allows a couple to file their taxes jointly, while a divorce does not. If you have questions about the potential benefits or drawbacks of filing for a legal separation or a divorce, discuss your concerns with an attorney and/or a financial professional. Am I Eligible to File for a Legal Separation in OC California? Like divorces, legal separations also have requirements that must be met in order for a couple to be eligible to apply. Depending on whether you are in a marriage or a registered domestic partnership, the residency requirements may vary slightly. If you are married and you wish to file for a legal separation, either you or your spouse must be living in California at the time that you file. Keep in mind that it may be difficult to enforce certain court orders if you and your spouse are not both living in California. If, as a married couple, you wish to obtain a divorce, you or your spouse must have been living in California for at least six months, three of which must be in the county where the divorce is filed. So, if you file for a legal separation and it is subsequently granted, you may also file for a divorce when you meet the requirements. If you are in a registered domestic partnership, and your domestic partnership was registered in California, you may file for a legal separation in California regardless of where either of you currently resides. If you are in a registered domestic partnership and your domestic partnership was not registered in California, you may file for a legal separation only if one partner is currently residing in California. Like married couples, keep in mind that if you and your partner do not both reside in California at the time you file for a legal separation, it may be difficult to enforce certain orders that come with your separation. How Can I File for a Legal Separation in California? How do I know if I am Eligible to File for a Legal Separation in Orange County California? The process of obtaining a legal separation is similar to the process of filing for divorce. You may opt to resolve your legal separation outside of the courtroom through mediation. Mediation allows you and your spouse or partner to work with a trained, neutral, third party mediator. The mediator will help the two of you set common goals and work together to resolve your issues and reach your goals. If you are unable to work through your issues in mediation, you can go to court and allow a judge to make your divorce decisions for you. Regardless of how you resolve your issues, one of you will need to file a case with the court to make the separation official. If you can work with your spouse or partner, there will be a lot less paperwork to handle. Within the legal system, a legal separation begins with a petition to the court asking for a legal separation. You may also need documents regarding child custody, property division, and child support, depending on your family situation. Once you have filled out the appropriate forms, have an attorney or your family law facilitator look over the forms to make sure that they are filled out correctly and completely, and that you have chosen the correct forms, and all of the correct forms. You will need at least two copies of all forms, in addition to the original. File the original with the court, and have the copies stamped before serving one copy on your spouse or partner. The second copy is for your records. The next steps involve exposing all of your property, debts, and assets, and coming to terms with your spouse on what is best for your family - or creating agreements for your legal separation. The court may require mediation, or you may opt to go through mediation on your own. Make sure to appear at any court hearings or mediation sessions, and if you have an agreement outside of the courtroom, submit it to the judge. Your attorney can help you understand whether there are necessary steps following the judge signing your court order - different California Courts work differently at this point. Do I need an Orange County California Legal Separation Attorney to help me with my family law case? If you have questions about filing for a legal separation in California, contact an attorney as soon as possible. The lawyers at Yanez & Associates are here to help - contact us today to schedule your free initial consultation. 2 What is a Legal Separation and How Does it Differ From Divorce in California? 3 Why Would I File for a Legal Separation in Orange County California? 4 Am I Eligible to File for a Legal Separation in OC California? 5 How Can I File for a Legal Separation in California? 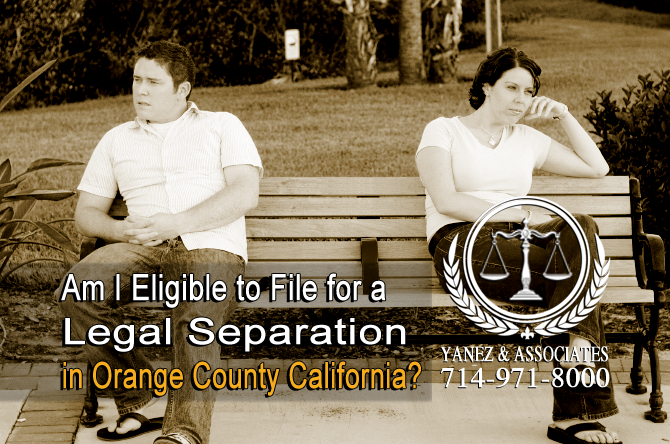 Am I Eligible to File for a Legal Separation in OC California?, California Divorce vs Legal Separation, Date of Separation in an OC California Divorce, Divorce vs Legal Separation in Orange County, How Can I File for a Legal Separation in California?, Legal Separation, Legal Separation in Orange County California, Legal Separation Orange County CA, Orange County CADivorce Process FAQ, Orange County Legal Separation Attorneys, What is a Legal Separation and How Does it Differ From Divorce in California?, Why Would I File for a Legal Separation in Orange County California? What is the difference between Divorce and Legal Separation in Orange County California?